According to the rabbis, there is one chapter in the Bible that is so dangerous, it is forbidden to be taught to groups of disciples. It could be taught to no more than one student at a time, and only if he is a mature student. This chapter is so dangerous, it is forbidden to be read in the regular synagogue service. It led some of Israel's most famous rabbis to engage in strange mystical practices that killed one of them, made another crazy, and led another to heresy. For hundreds of years, even the name of this chapter caused knowledgeable Jews to shudder. What chapter is this? They call it Merkabah: The Chariot. 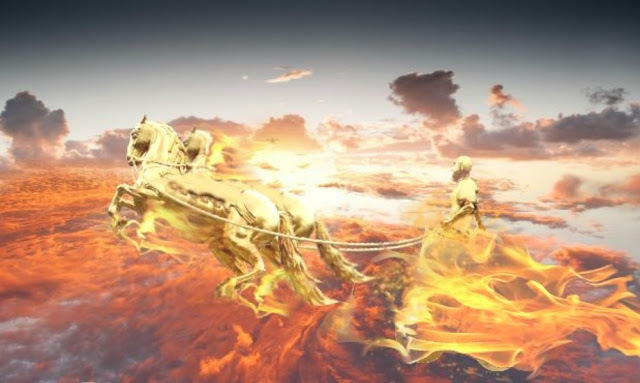 The chariot was a powerful religious symbol for ancient Israel: not the ordinary chariots used for war, but what the Bible calls "chariots of fire." The first mention of chariots of fire is in 2 Kings 2:11. This is the story of Elijah being caught up into heaven. Although tradition imagines it was the chariot that carried him away ("Swing low, sweet chariot"), the Bible says a fiery chariot and its horses separated Elijah from Elisha, his disciple, while a strong storm-wind snatched Elijah away. Who was driving the chariot? It doesn't say very mysterious. The next mention of chariots of fire is in 2 Kings 6:17. Elisha, now a famous prophet in his own right, was trapped in the small town of Dothan at the edge of Galilee by the army of the Arameans. They were the enemy of Israel, ruling from Damascus as the Syrians do today. They had come to Dothan to capture Elisha because he was constantly defeating their secret war plans by revealing them to the king of Israel. The sight of the vast enemy army frightened Elisha's servant. So Elisha calmly prayed for the servant's spiritual eyes to be opened. When they were, he saw the mountain on which the city was built covered with horses and chariots of fire. The book of Psalms mentions chariots of fire in a poetic declaration of God's overwhelming power: "The chariots of God are tens of thousands thousands of times over. The Lord is with them, as at Sinai in holiness" (Psa. 68:17). But perhaps the strangest mention of a chariot in the Bible is in 1 Chronicles 28:18. This section gives the details of David's plans for the construction of the Temple, later realized by his son, Solomon. In the plans for the innermost chamber of the Temple, along with the ark of the covenant, is a golden chariot (merkabah). What is a chariot doing in the holiest part of the Temple? A careful reading of the verse shows that it has something to do with the two large angels (cherubim) that Solomon placed in the Holy of Holies, whose wings, from the wingtips of one to the wingtips of the other, stretched across that innermost chamber. But why a chariot? The answer was discovered a few years ago by an archaeologist, Leen Ritmeyer, flying at 30,000 feet to Israel from the U.S. He got bored with the movie, and took out his plans of the ancient Temple Mount in Jerusalem. He had been studying the large piece of bedrock that sticks up six feet above floor level under the central dome of the Dome of the Rock, the gold-domed Muslim shrine that stands in the middle of the ancient Temple site. Many have speculated that this rock was once the location of the Holy of Holies. But no one had ever been able to prove it until now. On the basis of natural rock contours and marks in the rock, he had already been able to locate the walls of an ancient room once built there. The measurements of this room were exactly the same as the Holy of Holies in the Temple of Solomon. But now, as he looked at a photo of the rock, he noticed a small depression, exactly in the center of this ancient room. No one had paid much attention to it before, because of all the other cuts and marks in the rock. But when he measured it, he was shocked to find this depression had the same dimensions as the ark of the covenant! Perhaps this was the very "place" that Solomon had prepared in which to set the ark (2 Chron. 5:7). There was only one problem: the depression was facing the wrong way. We usually picture the ark with its side facing out , and the two small golden angels (the cherubim) that are attached to its cover visible on either side. But the depression was going the other way: with the narrow end facing out. Now that was really odd! Why would the narrow end of the ark face outward? And then it hit him. Of course! That was the way the ark of the covenant faced when it was carried out before the people in the time of Moses and Joshua. They would naturally have put the ark in the Temple facing the same way to show God leading the way before his people. In fact, this is the only way to make sense of the fact that when they first put the ark in the Temple, the poles used to carry it stuck out from the Holy of Holies (1 Kings 8:8). But what does all this have to do with a chariot? As we said, Solomon built two huge angels standing at the sides of the ark of the covenant. These angels were not beautiful women with wings, as we usually picture them. Lady angels are a pagan idea picked up much later by the church. In the Bible, angels appear either as men or as ferocious beasts part lion, part bull, etc. strange and frightening mixtures of different animals. This view was not unique to ancient Israel, but was shared by all the surrounding nations. Many, many pieces of ancient art have been discovered showing this frightening type of cherub. With the ark facing out, and one of these large animal-like cherubs on either side, it would look not just like they were standing next to the ark, but that they were pulling it like a chariot! This idea is not strange to the Bible. One of the oft-repeated descriptions of God is that he sits on the cherubs, or rides on them (2 Kin. 19:15, Ps. 80:1, Ps. 99:1, 2 Sam. 22:11, Psa. 18:10). The ark flanked by animal-like cherubs is the chariot of God mentioned in 1 Chronicles! The appearance of this luminous being is clearly the purpose and the climax of the vision. When Ezekiel sees him, he falls to his face, humbling himself in an attitude of worship (vs. 28). But the figure on the throne commands him to rise. No sooner are these words spoken than the Holy Spirit enters Ezekiel and sets him on his feet (2:2). The mysterious man then begins to speak to the prophet in the name and with the authority of God: "I am sending you," he says without, like the angels, claiming to speak for another "and you will say to them, `This is what the Lord God says'" (2:4). Who is this that dares to speak with the authority of God? It could not be God the Father himself, for the idea of the Father appearing in any particular form was unthinkable. God is Spirit, the Bible says, and so cannot be confined to any one time or place. So who is this? This is where it started to get dangerous for those rabbis. The identity of this mysterious being is given in 1:28, though often obscured in translation. The original Hebrew says: "He is the appearance of the likeness of the glory of God." Does that sound familiar? It's the source of Hebrews 1:3, which says, "And he is the radiance of (God's) glory and the exact representation of his nature." Hebrews identifies this radiant one as Jesus, the Messiah. By alluding or hinting to Ezekiel, Hebrews interprets Ezekiel's prophecy for us: Jesus is the one sitting on the throne who speaks as God and who is God. This is what made this chapter dangerous to those early rabbis because it is so clearly fulfilled in Jesus. The rabbi who became a "heretic" most likely realized that this was Jesus on the throne. Do you know anyone today that has trouble accepting the tri-unity of God? Tell them about the one sitting in the Chariot of God, who speaks as God, and is God! In Ezekiel 1:27, it says this human figure appeared like glowing metal. This is a detail that should not be overlooked. A radiant man with legs like glowing metal also appears in Daniel 10:6, and again in Revelation 1:15. Who is it? The same person Jesus!, not as he appeared on earth in the humility of his humanity, but as he appears in heaven, filled with the power and the majesty of God. He is the appearance of the glory of God! This is how he appeared to his disciples on the Mt. of Transfiguration: not as an ordinary man, but in the fiery power of God. His face was radiant as the sun, his garments white as light (Matt. 17:2). He is the appearance of the glory of God. No wonder Ezekiel fell down in worship! 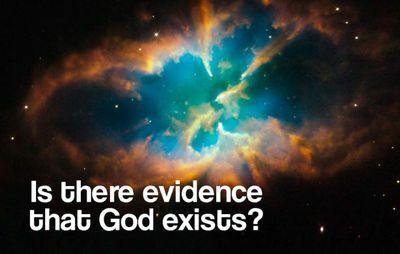 Many people claim God doesn't exist, and I often hear people say there's no proof or evidence to believe in God's existence. "You just have to accept it on faith," they say. "There's no evidence." This statement is made as if it's a fact. But is it? No way. Nothing could be further from the truth. People can prove God's existence in any number of ways. But for me, one piece of evidence stands above all others. It's inarguable. We can all see it. It's a modern-day miracle - proof of God's existence in plain view of everyone living in the world today. What is this rock-solid evidence? If you haven't guessed already - it's the modern-day nation of Israel. Approximately 4,000 years ago, the Bible says God promised Abraham, "I will make your descendants as numerous as the stars" (Genesis 22:17), and "I will bless those who bless you and curse those who curse you" (Genesis 12:3). God kept His promise, and we are all witnesses. Despite centuries of persecution and national tragedy, both the Jewish people and the nation of Israel endure. How many others can make the same claim? How many other groups of people have been conquered, enslaved, and persecuted all over the world yet managed to not only survive, but retain their unique cultural, religious, and ethnic identity? Only the Jewish people can make this claim. And it's proof the God of Abraham, Isaac, and Jacob is the one true God. Why do I say this? Because after all that's happened over the centuries, the Jewish people continue to thrive and the nation of Israel still exists - just as God promised. History tells us this is true. After all, have you ever met a Carthaginian? How about a Babylonian? Me neither. Yet the Jewish people miraculously survived as a distinct people for nearly 2,000 years without a homeland of their own. And that's not just in the face of Roman conquerors. They survived the Spanish Inquisition, Hitler's Holocaust, and numerous other atrocities. How is this possible? There's only one explanation - God said they would. The survival and success of the Jewish people proves God's existence. But for those who need further convincing, God provided another miracle in our day and time - the miracle of the restored nation of Israel. How many conquered nations have reappeared? How many nations have been destroyed, their people taken to other lands as slaves, and then nineteen centuries later they reappear? As far as I can tell, only one - the nation of Israel. Not only is this a historical first, it was foretold more than 2,000 years in advance. He promised to call them from "among the nations" (Ezekiel 39:28), from "the farthest corners of the earth" (Isaiah 11:12), and from "north, south, east, and west" (Psalm 107:3). As early as the days of Moses, God made this promise: "Even though you are banished to the ends of the earth, the Lord your God will gather you from there and bring you back again. The Lord your God will return you to the land that belonged to your ancestors, and you will possess that land again" (Deuteronomy 30:4-5, NLT). God kept His promise. Modern-day Israel is the proof. He said when He brings His people back into the land of Israel, the desert will bloom (Isaiah 35:1), and the Lord will return to destroy Israel's enemies (Isaiah 35:2-4). Through Jeremiah, God said once He brings His people back into the land, He will raise up a righteous king who will rule the land with wisdom - the long-awaited Messiah (Jeremiah 23:3-6). Through Micah, God promised to gather His exiles and form them into a strong nation. Then, He promised to rule from Jerusalem as their king forever (Micah 4:6-7). Over and over again, the prophet Isaiah relayed God's promise to bring back the exiled people of Israel and form a new nation. Through Isaiah, God promised to restore the nation of Israel and raise its flag among the nations (Isaiah 11:12). And then? Because the heir to David's throne (Jesus Christ) will rule over the nations, transforming the world into a place of peace and tranquility (Isaiah 11:10). And when does God say this will happen? God didn't promise to restore Israel and then send the Messiah a thousand years later. The prophets intimately linked these two events. And they're not the only ones. Jesus Himself did. He said "And Jerusalem will be trampled by the Gentiles until the period of the Gentiles comes to an end" (Luke 21:24). Today, the Jewish people control Jerusalem. It's the capital of Israel. Then Jesus said, "When all these things happen, look up, because your salvation is near" (Luke 21:28). NO WORD IN THE BIBLE THAT MEANS RAPTURE...REALLY?